Program sponsors Charlie Riley; Michael Gelbman; Dave Wilderotter of Tahoe Daveâs Skis and Boards; Doug Wright of Mountain Hardware & Sports and Jeff Ridgel of The Office BOSS presented Staron with a finalist award certificate and gifts from program sponsors. 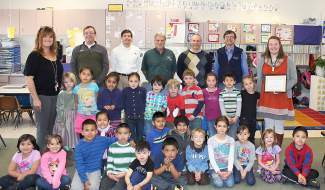 TAHOE/TRUCKEE, Calif. — Truckee Elementary Kindergarten teacher Ashley Staron has been selected as the fourth 2014 Truckee Hometown SEARS-Sierra Sun/North Tahoe Bonanza Teacher of the Year finalist. 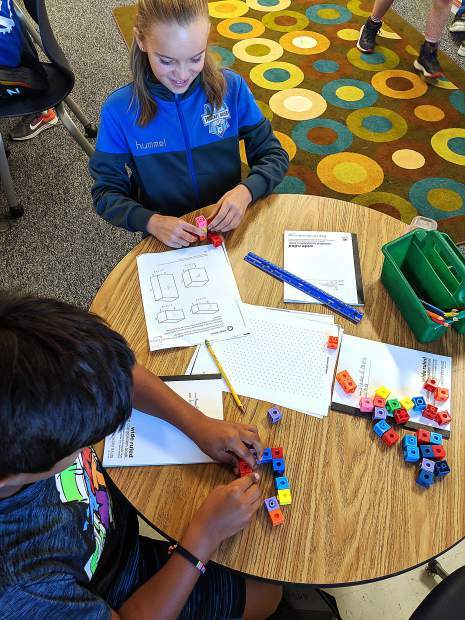 In her first year teaching at Truckee Elementary Staron has brought passion and enthusiasm to her new position. “She has brought her positive energy and new ideas that not only have infiltrated her kindergarten team but the entire school,” said Truckee Elementary principal Valerie Simpson. On March 6, program sponsors Charlie Riley owner of Truckee Hometown SEARS, Michael Gelbman publisher of the Sierra Sun/North Lake Tahoe Bonanza, Dave Wilderotter of Tahoe Dave’s Skis and Boards, Doug Wright of Mountain Hardware & Sports and Jeff Ridgel of The Office BOSS presented Staron with a finalist award certificate and gifts from program sponsors. Ashley Staron grew up on Long Island, New York. She attended college Green Mountain College in Vermont where she earned an elementary and special education teaching credential. Staron credits Green Mountain College with developing her passion for teaching. Professors there challenged her to become the best teacher possible and ultimately inspired her to pursue a Master’s in education with an ESL specialization. The master’s program at Sierra Nevada College is what brought Staron to Tahoe. She has loved living in an area that combines the water of Long Island with the mountains of Vermont and has decided to call Tahoe home. Last year Staron worked as the English Language Development Director at Squaw Valley Academy. There she was able to apply her master’s work, supporting students from countries around the world, learning English. Over the summer, Staron taught at Tahoe Truckee Unified School District’s K-Camp summer school program. There she was introduced to many of the students she would be teaching this school year. Teaching kindergarten is different from her position at Squaw Valley Academy, but Staron loves working with her young learners. Staron’s enthusiasm is helping her students build a solid foundation and prepare for future years. Staron feels blessed to be a part of the Truckee Elementary team. Her colleagues have given her much support and are always willing to share their ideas and strengths. Staron looks forward to building her career and spending the next 30 years teaching and inspiring students. She is already working on another certificate and will complete her bilingual credential shortly. Staron’s main focus, of course, is on her students. She admittedly has a hard time leaving work at the end of the day because there is always something more she can do. To nominate your teacher for the Truckee Hometown SEARS-Sierra Sun/North Lake Tahoe Bonanza Teacher of the Year award email tahoetruckeeteacheroftheyear@gmail.com or bring nominations to the Truckee Hometown SEARS store 12047 Donner Pass Road.